LxPup offers Openbox as it’s window manager, LxPanel as it’s panel manager and PCManFM as it’s file manager. 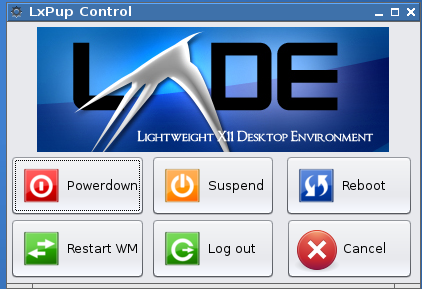 Optional enhancements to the desktop are available via the Options button on the Change Appearance menu item. (add a top panel or wbar, add extra right click options, add desktop drive icons and support for floppy disks). If you would prefer to install just OpenBox and LxPanel onto your Puppy instead of the full LXDE (i.e. retaining Rox as the file manager) then try OpenBoxPlus from Vicmz. I did a manual frugal install to a 16gb SDHC card. Downloading the iso was fast. The numbering scheme is potentially confusing. Was LxPup14 a beta? Also is the journal dead? LxPup13.10 is numbered from the 10th month of the 2013th year and is more of a successor to LxPup13.01 I believe. LxPup13.10 is smaller at 177MB because it comes with a different selection of "eye candy". Have added the link to the download page. to go through choosing the driver etc again but it's working fine. temporarily but restarting the wm fixed it. Glad to hear it's working OK for you. A very nice Slacko derived puplet. Congratulations! I'm sure Jejy69 is proud that his work and influence is carried forth. Who is this smargl7 bloke anyway? Never heard of him. One Q.. is your compiz sfs compatible? One annoyance (and this is one for the PCman devs, not you). When you mount a drive in the file manager and it happens to be the only tab open, on dismount PCmanfm closes. Would be more intuitive for incomers if it defaulted to $HOME instead of closing. I might raise it with them. TBH, I think this interface is the future (ha... yes, there is probably puppy a future, and if not a puppy like future) given that JWM, while very light on resources, does look aged, no matter how tasteful the theme is, and that rox seems to be approaching its "use by" date, given that no development has happened in 4 years, apart from essential bugfixes. deleted my reply to 01micko in error - hope he read it first!! pc is an hp desktop. I am downloading as I type this out. It sounds like you did a great job on this. I am very sure that Jejy69 would be pleased. I too have enjoyed his work, Now it will be yours as well. Well be testing soon. Thank you very much for this pup! This Puppy just works, and elegantly. I did know about the window title (it also applies to the Appearance changer window BTW) - it is a consequence of the way I built the iso using the LxPup-by-SFS components directly. I'll bear it in mind to change properly in the future.